Confession: I have been a little smitten with Jimmy Fallon for quite some time – since he was a young SNL player, giggling uncontrollably during sketch after sketch. His easygoing, likeable style has kept me coming back, show after show. I was thrilled when he visited Indy for a week to host the Late Show when our city hosted the Super Bowl a few years back. I was even more excited when it was announced that Jimmy would be Jay Leno’s Tonight Show successor. 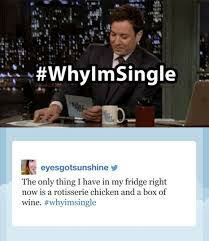 So, the Tonight Show. An institution in American television, right? For many years – since 1954, in fact – people have tuned in to watch a similar agenda: The host delivers a monologue, often inspired by current news and pop culture events. This is followed by a celebrity interview or two – sometimes a standup comic. The show often concludes with a musical act. And millions of people faithfully watch, and are entertained. Myself included. 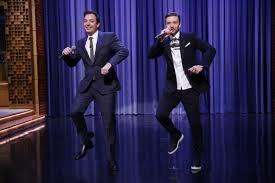 Then a few years back, Jimmy Fallon burst onto the late-night TV scene, and shook up the status quo. While there is still a monologue, celebrity interviews and many of the other mainstays of a successful late-night talk show formula, he added in a few elements that are more reflective of his personality, and really ushered in a new generation of this television genre. Because when have we been able to witness an Oscar winner (Diane Keaton) playing beer pong? Or cut up in the now-famous “Ewwww!” sketch with Will Ferrell and the First Lady of the United States, Michelle Obama? Or make up games like Faceketball? Or sing hit songs with kids’ classroom instruments? Or play Antler Ring Toss? I could definitely go on, but my point is this: He is a master at having fun, engaging his guests and audience, and being a little bit (or a lot) silly. And yes, he manages to make celebrities look a little ridiculous. “Egg Russian Roulette,” anyone? Look at the celebrities’ faces in the photos above. They are having fun. This is clearly not just another interview to promote their newest film or project. Sure, they have the opportunity to promote during the show, but I think it’s obvious that they also have a pretty good time when they hang out with Jimmy Fallon. And as a facilitator, I want to be like that. Okay, maybe I wouldn’t try to convince a participant to smash an egg on his head, but I would love for that participant to walk out of a session I facilitated confident that he not only learned something, but also enjoyed himself. Try something different. As the photos in this post indicate, you really never know what you’re going to encounter on the Tonight Show. Have you been using the same icebreakers, energizers or group exercises for a long time? Maybe it’s time to retire the old and bring a new activity into your rotation. Have fun with your participants. Get involved in discussions, do something silly and unexpected. If something is funny, laugh! Humor can be an effective way to connect with your audience – just keep it appropriate, of course! I may just “steal” the Hashtags idea to use as an icebreaker….I’ll keep you posted, Phase(Two)Nation. 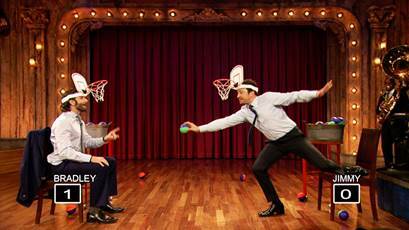 Your turn: Jimmy Fallon has found a niche among the noisy late-night talk show space. He always looks like he’s having the time of his life…which draws people in. So, fellow facilitators, let’s shake up the status quo in the noisy space of training classes and other learning events. What can we do to convey passion for what we do, genuine interest in our audience, and have fun? Share your ideas in the comments below! Know someone who might like this post? Be kind and share it! Did you happen to catch the special episode of the Tonight Show after the Super Bowl? There was another epic Lip Sync Battle (not a new thing) between Jimmy Fallon, Will Ferrell and Kevin Hart. Absolutely hilarious – if you’re looking for a hearty laugh, check out the video below!